Nokia today announced the arrival of new Nokia Music Stores, more Comes With Music launches and three new music devices. The Nokia 5730 XpressMusic, Nokia 5330 XpressMusic and Nokia 5030 bring people’s music to life with features that give music lovers around the world easy access to the music they love. By expanding the music range to different price points, introducing more markets with Comes With Music service and the Nokia Music Store as well as making the integration of these elements as easy as possible, on both on the mobile device and the PC, Nokia is changing the way music is enjoyed. The digital music player that rings in your pocket is also the library, the shop and the platform to manage all your music. Currently available in 15 markets across three continents, the Nokia Music Store lets people browse or purchase music, get recommendations or search for their favorite artists, songs or albums directly from their device. Nokia Music for PC software makes it easy to organise and transfer the music between a PC and compatible device, rip and burn CDs, as well as discover, stream and download directly from the Nokia Music Store. Today, Mexico was the latest country to launch a Nokia Music Store with additional markets such as Portugal, Norway and South Africa joining the fold in the coming months. Comes With Music gives people unlimited music downloads from the Nokia Music Store for a year or 18 months. People can choose from millions of tracks to download and keep them, even once the year is over. Currently available in the United Kingdom and Singapore, Comes With Music will launch in Australia later this month. Additional launches, including Italy, Sweden and Mexico, are planned for the coming several months. The newest additions to the Nokia XpressMusic range – the Nokia 5730 XpressMusic and Nokia 5330 XpressMusic – will be offered as Comes With Music compatible devices in selected markets. 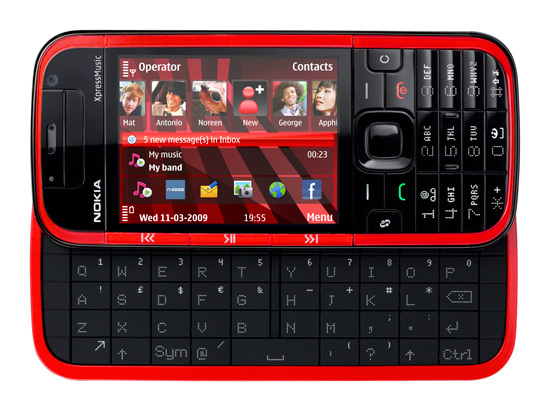 The Nokia 5730 XpressMusic is Nokia’s first music-optimized device to offer a full QWERTY keyboard – ideal for quick messaging. The heart of this music device is the Homescreen for XpressMusic, providing access and dynamic information on music, people, games, email and calendar.The Homescreen features an improved contacts bar with up to 20 friends and family members and provides direct access to music, N-Gage and other applications, like Facebook, Photos, Ovi Contacts, Maps, messaging and more. With Ovi Contacts, people see which friends are online, chat and even view what music they are listening to. The Music shortcut offers a quick access to the music stored on the device as well as to the Nokia Music Store where they can find for information on artists, music and over-the-air downloads, directly on the device. With the dedicated gaming keys the Nokia 5730 XpressMusic is a true N-Gage gadget. Direct access to the N-Gage Arena community and the preloaded N-Gage games invite to connect and compete and check high scores with online friends. Nokia also launched the Nokia Mobile Holder CR-110 to keep the Nokia 5730 XpressMusic firmly in place. The Nokia 5730 XpressMusic is expected to begin shipping in the third quarter of 2009 for an estimated retail price of 280 EUR before subsidies and taxes. With its edgy, top-sliced design and illumination effects, Nokia 5330 XpressMusic is ideal for music and keeping in touch with your social network. XpressMusic touch keys on the side of the display provide instant access to music. The standard 3.5mm jack offers crystal clear sound for any headphones, and the extended battery life gives more than 26 hours of playback time. 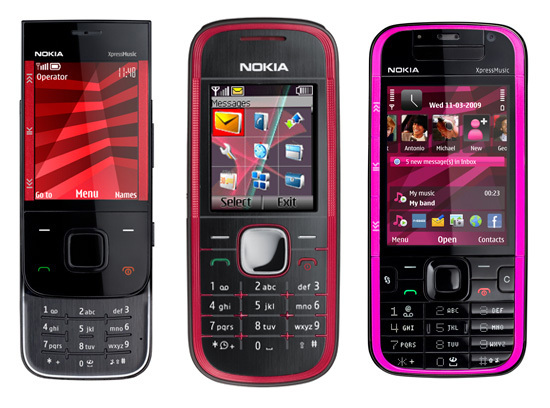 Of course, the Nokia 5330 XpressMusic provides access to sites that specialize in online sharing, including Ovi, Facebook, and MySpace. The Nokia 5330 XpressMusic is expected to be available in the third quarter of 2009 for an estimated retail price of 160 EUR. 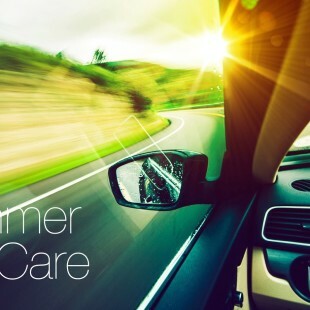 To enhance your music listening experience on the go, Nokia offers a variety of accessories. Nokia Bluetooth Stereo Headset BH-504 – that has recently started shipping – has high quality audio with powerful speakers, echo cancellation and noise reduction. Nokia Stereo Headset WH-500 is also great for both music and calls and compatible with a broad range of devices. Both headsets are easy to fold up and store in the carrying pouch. The small-size Nokia Mini Speakers MD-8 with extra long playtime are ideal for sharing favorite songs with friends. Nokia 5030 is the company’s first phone with an internal FM radio antenna, which eliminates the need for a headset or external speakers. The one touch FM radio and channel selection keys on the side of the device ensure the product lives up to its XpressRadio name. Placed sideways on the table, the Nokia 5030 doubles as a portable FM radio and is ideal for emerging markets, where people rely on a radio as their main source of entertainment and news. 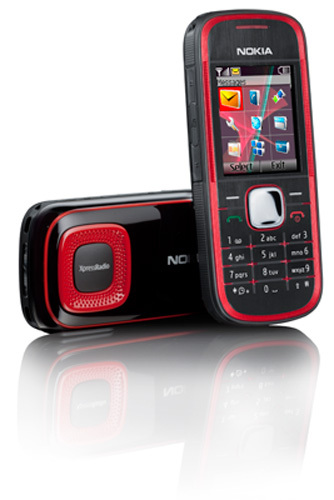 The Nokia 5030 has up to a day of listening time and 10 hours of talk time, which comes to life with the powerful loudspeaker, and is available in two colors – graphite and red. One of Nokia’s most affordable devices to offer an FM radio, the Nokia 5030 is expected to begin shipping in the second quarter of 2009 with an estimated retail price of less than 40 EUR, before taxes or subsidies.